When drafting a will, you have a number of options for how you want to distribute property to your loved ones. One option is to make specific bequests, which means to list individual items of property and who they should go to; for example, you may bequeath your diamond necklace to your granddaughter. You can also include demonstrative bequests, which means you designate a certain amount of property from a specific source to go to an individual, such as a sum of money from your savings account. Similarly, you can make a general bequest, such as $500, without specifying its source. Finally, you can specify a residuary gift, which refers to all property you did not otherwise refer to in your will. For example, you may have anything remaining split evenly between your living children. Simply designating that your property be divided equally among two or more people may create stress and arguments between your loved ones. It's not possible to divide a lot of property, so such a bequest may require your family to sell items with sentimental value to split the profits. For that reason, you may decide to use a different plan, such as giving your house to one family member and your business to another. The bequests may not be completely equal, but they will be easier for your family to follow. Another consideration is how property will be divided if one of your children dies before you do. For example, you may want to divide $100,000 evenly between your son and your daughter. If your daughter dies before you do, your grandchildren will take her share. If you specified that property be divided "by representation," your son would receive $50,000, and if your daughter had two children, each would receive $25,000. If you instead specified that the property be distributed "per capita," your son would receive $33,333, as would your grandchildren. Under this scenario, if you designated "per stirpes" distribution, it would be the same as by representation. If both your children died before you, and your son had one child, each child would receive $33,333 under "per capita" rules. Similarly, with representation, all the children would receive $33,333. The final option for distribution, "per stirpes," would provide that your son's child would receive $50,000, and your daughter's children would each get $25,000. If the will does not specify a certain type of distribution, it will likely default to whatever scheme is set by state law. After you die, your property will likely be distributed through probate. During probate, the court supervises the process of gathering your assets, paying debts, and distributing property according to your will. 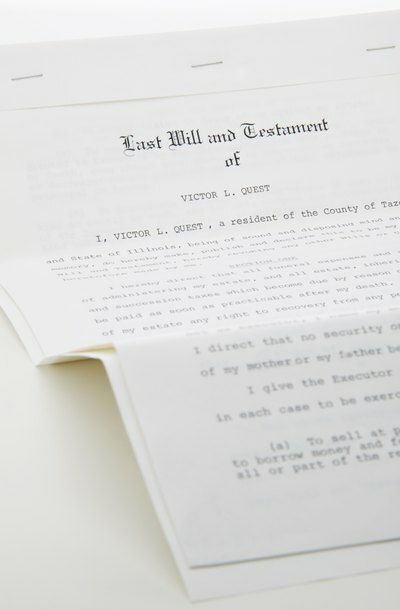 The laws vary by state, but generally an executor or personal representative, who may be named in your will or appointed by the court, is in charge of administering the estate. The executor is typically the one responsible for accumulating all the assets, selling them if necessary, paying any debts or taxes due out of the estate, and then dividing the property according to the will.